We wanted a light lunch today, so I decided to utilize some beets I’d made yesterday. Beets are kinda scary, because they’re awfully messy, but both C and I think they’re DELICIOUS! Though, we have learned that small children should probably only be feed yellow beets until they’re…oh, say 32 (they stain). Rinse them in water, dump them unceremoniously in a baking vessel of some sort (I tend to like a pie dish), add about half an inch of water, cover the whole thing with foil, whack that bad boy into the oven (on 350°F) for like, an hour or so – or until you pick the kids up from school. The beets are done when a knife slides in and out very easily from their middles. BEWARE – when you open the foil the steam billows & it’s hot. Leave the beets until they’re cool, then grab a wad of paper towels or a kitchen towel you don’t mind getting stained. Hold the beet with one hand and use a different paper towel/kitchen towel to rub the skin off the beet. It should peel off and astound you with the ease with which it does so. BEWARE #2 – don’t wear anything you don’t mind staining while doing this. Also, the juice will only stain your hands for a few hours. Don’t stress. If you’re going to use the beets right here and now – have at them. I shoved mine in a plastic tupperware thingie and into the fridge they went. Today, I pulled them out, sliced the relatively thinly, then spread them slices out on a plate. I sprinkled them with 2T of Gorgonzola crumbles, threw on some chopped pecans for texture, tossed on a few clementine segments for a hint of sweetness/acidity, then drizzled everything with some good olive oil. Oh and a teensy little bit of smoked sea salt. 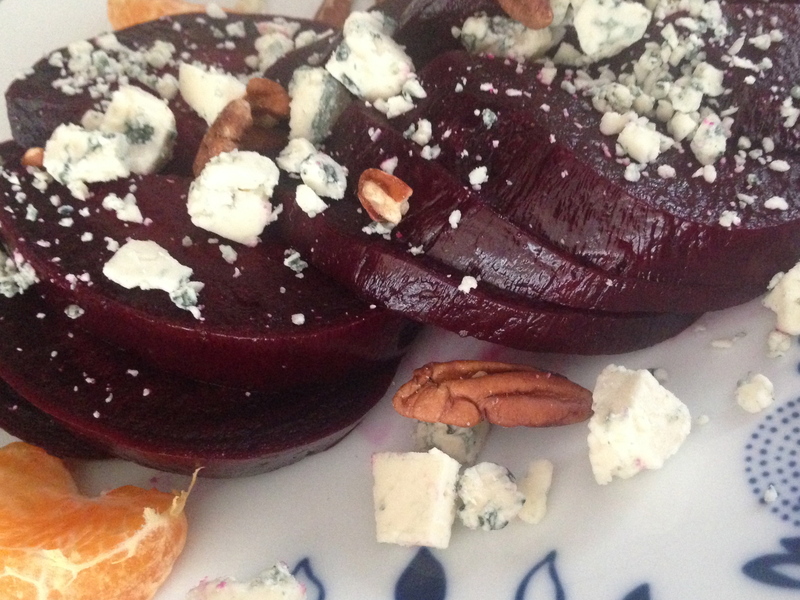 Roasted Beets, peeled, sliced thinly, chilled – 1 per person. The size I buy them is a little bit bigger than a clenched fist. Make sure that they’re hard and not rubbery when you peruse them at the store. They will last a few days longer on your counter until you’re ready to cook them. 1-3t of Nuts, toasted and then chopped **I used Pecans, but the original salad had hazelnuts. I think they were candied too. But let’s not get carried away here! ***I think I forgot to toast my nuts today. You should toast your nuts. Waaaay better tasting. Citrus segments – If possible, supreme them. It’s soooooo much prettier. Watch THIS chef do it to learn how (or google it yourself). Today I used a clementine. A grapefruit would’ve been better. Stronger/bolder flavor to balance the strong Gorgonzola. Sea Salt **I used some Smoked Falksalt – seriously, smoked sea salt is a new thing and THESE guys rock the freakin’ boat. Not just for Goat Cheese anymore! 1- If you’ve not done so, please roast your lovely beets now (washed veg + baking vessel + water , then covered in foil > 350°F oven for 1+ hours). Let cool, then peel, then slice. 2- Spread said beets on a plate. Pretend you’re a fancy chef and get your decoration skills on. 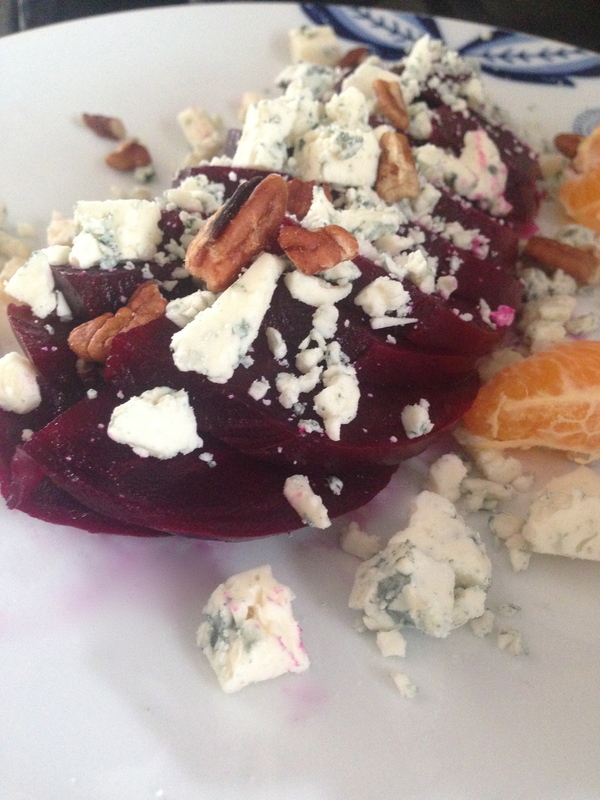 The beets were GREAT with the Gorgonzola. Supremed citrus would’ve been better, as would toasted and/or candied nuts, but for a throw-together kinda light lunch, this was easy, FAST (because I already had beets made), and quite nice.